The “GIS in the real world” lecture I have just given today at the University of Western Australia. I’ve briefly summarised each talk, and embedded the Slideshare presentations below. In this talk, I gave a brief history of my career “with” the spatial industry (not “in” it), and some career advice to the students. The distinction is that I’ve usually been employed as something other than a “Spatial/GIS Something” – like an Ecologist – and that tells you my role was not full-time spatial (hence the “with”, not the “in”). 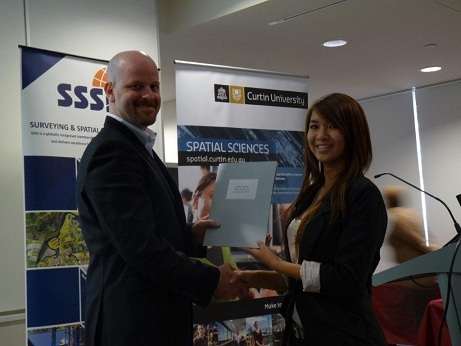 Curtin’s Spatial Sciences students seem to be mainly surveyors, with a few Spatial Science types thrown in – my aim here was to talk to the latter rather than the former, and help show them what you can do with the knowledge they’ve learned. And hopefully give them some advice that they can use for their career, anyway. This year, I presented the Gaia Resources scholarship to Linda Nguyen. This is the sixth year we’ve presented our scholarship, so that would equate to just shy of $20,000 we’ve put into students as direct funding over the life of the scholarship to date. Adding in the actual work we’ve given the students over time – paid work – would bring that value up considerably. Our students have in the past worked on chargeable projects, and that helps cover the costs, but more importantly, I hope it’s given a few more people an interest in the spatial field that has turned out a few more graduates. As part of the “Introduction to GIS” units and offerings from UWA, they have an annual “GIS in the real world” lecture which I gave yesterday. The UWA students are really different from the Curtin ones – these guys are Environmental Science students, or Anthropologists, or Environmental Engineers. They do this unit primarily to acquaint themselves with GIS, but very few of them are looking at working full-time in a GIS position. So I gave them an overview of what we do in terms of projects (using examples from the Conservation Commission, Newcrest Mining, South Coast NRM and the Atlas of Living Australia). It was pretty tongue in cheek throughout, and hopefully the students got that we don’t take ourselves overly seriously, but have some great project, clients and colleagues. The other part of the future of the industry that I haven’t spoken to in this whirlwind week is the Software Engineering students (unfortunately I missed the recent inaugural WASSIG event, but I hope to get along to one of those soon). For the last two years, we ran student projects with Curtin University’s Computer Science department. This was project based, namely that we came up with some ideas and then the students assembled a team, picked the project and came to work with us – we were, in effect their clients. This year, our proposed project didn’t get through to the students as they didn’t have enough students and too many projects from companies like us – disappointing, but it also has made us pause to do some thinking to how we run our student involvement. Over the coming months, Gaia Resources will be reviewing every part of our student involvement; there will be some changes made as a result. I’ve already been talking to representatives from various Universities to come up with ideas about how we can work and do research with each of them. I’m also looking forward to having some time at WASSIC this week to hear about the national picture on education from George Havakis and the panel that is being prepared for Day Two of the conference, and the opportunities coming from a range of national training schemes. Students – and the programs that they study – need to be aligned to where our industry is going, or where we want it to go. As mentors and employers, our interaction with both individual students and educational institutions (not just Universities, either) needs to be considered, targeted for both the student and sponsor, and above all it needs to shape the future we want to have in our industry. And to finish off, I’ve been given a fair bit of stick about one of the pictures I’ve used in my talks, a picture of me in 1997, relaxing in my apartment in Singapore when I was up there to work with their government. If you want to be traumatised, click this link. As usual, if you want to follow up on this, please leave a comment below, drop me an email or continue the conversation on Twitter.